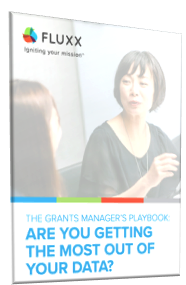 The Grants Manager's PlaybookL Are You Getting the Most Out of Your Data? THE GRANTS MANAGER'S PLAYBOOK: ARE YOU GETTING THE MOST OUT OF YOUR FOUNDATION'S DATA? It’s a data filled world, and grants managers are poised to conquer it. Grants managers have always understood the importance of data, even if they don’t always consider themselves data mavens or tech gurus. As true cornerstones in the grantmaking process, grants managers touch their organizations’ data in a number of ways.